When you have to send large files on the Internet, you usually use the email but there is always a limit with most of the email services. That is where you use one of the file hosting services, where the files can be uploaded and shared with the contacts you wanted to send the files to. There are several popular services that let you host large websites and share them publicly or privately, but some come with certain limitations, and some are humble enough to give you no limits for the size of file to be uploaded. When we talk of file hosting services, Dropbox cannot be ignored. It indeed is one of the best file hosting services right now on the Internet. Using the desktop application of Dropbox, you can simply upload a file of any size (important for those who are sharing very large documents, or movie files internally) and then share it with contacts using their email address, or easily get a web link to share it. There are plans from free personal use to one for teams (business plan). The free plan gives you 2GB of free storage and you can increase that with referrals, but the Dropbox Pro costs $10 per month, and with this, the user gets to 1 TB (1,000 GB) of space. One of the most recommended services by us for sharing large files online. Sign up for a free account here. Google Drive is huge, and while it doesn’t give you a certain limit for the number of files you can keep in your Drive folder, the maximum size of the file you can upload is 1TB, which is great. The Drive can work with the various Google apps, as well as with the Gmail app although if you had to send a file within the mail, the limit is 25MB. 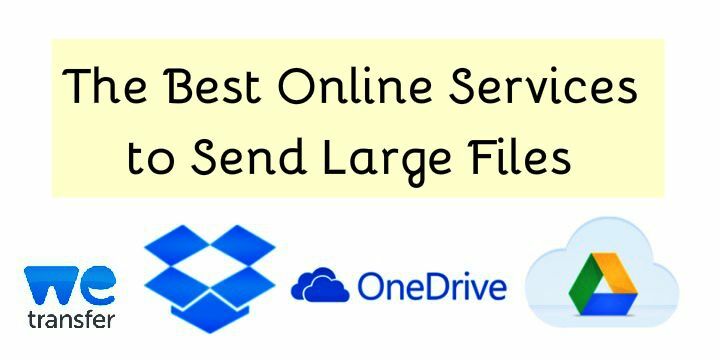 A service from Microsoft, OneDrive allows the users to store files and the maximum file size allowed for upload is 2GB, which is still large enough. Even this comes with both, web and desktop platforms for the file upload. But the limit is same on both of them, i.e. 2GB is the maximum file size. This is a little different kind of service, compared to the above three shared ones, and WeTransfer is something useful for those who wanted to temporarily share a file with someone and doesn’t want to save it for always. The website directly allows a user to send files of up to 2GB in size and the file stays on the server for seven days, and later gets deleted. To use WeTransfer there is no need to register to the website, and you just need to mention the email address of the receiver to share the file with them. A few special mentions apart from these include Skype (where you can share peer to peer and the size is unlimited), JustBeamIt (where you can share file with no size limit, peer to peer) and Infinit, which works on both Mac and Windows and this again is a peer to peer transfer of files with no size limit. Thank you for the post! I personally prefer MyAirBridge (www.myairbridge.com). Totally for free you can send up to 20 GB, with profile up to 100 GB!